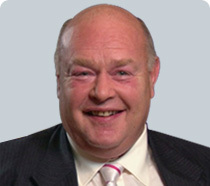 Designed by pioneering orthopaedic surgeon Professor Derek McMinn, the Custom Polyethylene Hip Resurfacing is described as ‘the next generation of Hip Resurfacing’. The device offers an alternative bone conserving procedure for patients who show an allergy to metals. The aim of a new generation Hip Resurfacing is to use the successful bearing materials of the modern Total Hip Replacement (THR) in a bone conserving design. Professor McMinn and his team have been developing the new Polyethylene Hip Resurfacing prostheses for the past five years. 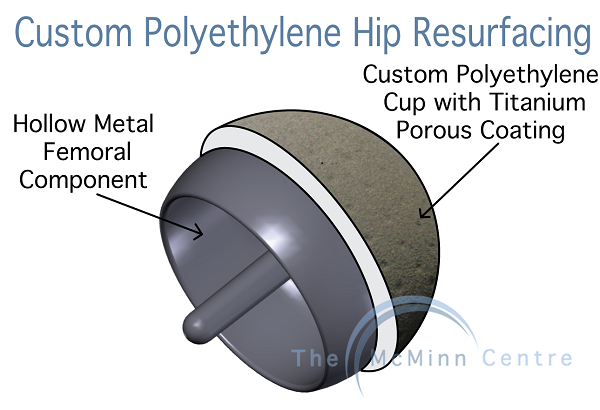 Extensive research and laboratory tests have led to the design of the Custom Polyethylene Hip Resurfacing. The acetabular cup is manufactured from highly cross-linked polyethylene, an extremely strong material that has a layer of Titanium porous coating on the outer surface to enable bone in-growth. Historic THR results show that this gives a long term fixation to the pelvis. The femoral component is the metal element of the prosthesis, made of a cobalt-chrome alloy which contains cobalt, chromium and molybdenum, and around 1% of different trace materials including carbon, silicon and nickel. As we know, metal-on-polyethylene articulations significantly reduce the metal debris from wear. Together, this metal-on-polyethylene articulation is an ideal solution for patients, particularly women, who have an allergy to metals. 54-year old Elaine Williams, an ex-professional ballet dancer, yoga teacher and film and television actress, presented with a 2-year history of right hip pain. Her x-rays showed mild dysplasia (shallow acetabular) with signs of advanced arthritis in the right hip. She also gave a history of experiencing redness in her ears with costume jewellery that she has to wear during theatre performances. When her blood was tested for metal sensitivity using a specialised test called Lymphocyte Transformation Test (LTT), she was found to have sensitivity to chromium. 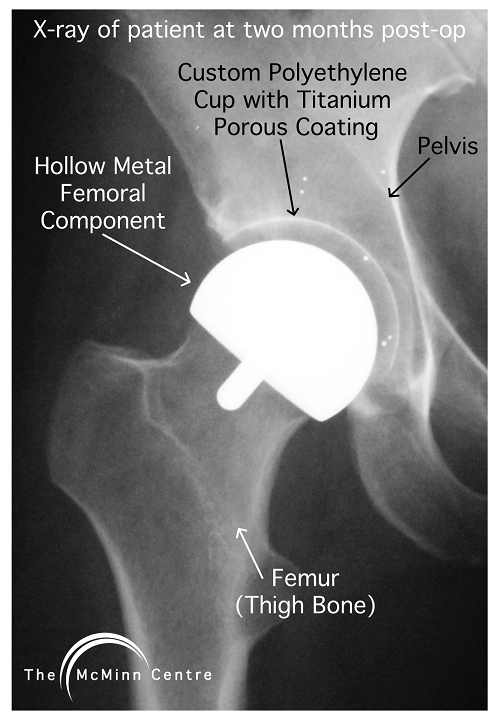 Since chromium is a major constituent of metal-on-metal resurfacing components, she was unsuitable for a Birmingham Hip Resurfacing (BHR), and was offered a conventional Total Hip Replacement (THR) with a metal-on-polyethylene bearing, but was absolutely against the idea as she wanted to continue with her active life. She instead chose to undergo a Custom Polyethylene Hip Resurfacing with Professor McMinn. Two months after surgery, Elaine has made a good recovery and has a good range of movement in her right hip. She is steadily progressing on to more and more activities with the passage of time. You can watch a video interview with Elaine by clicking on the ‘Video’ tab above.